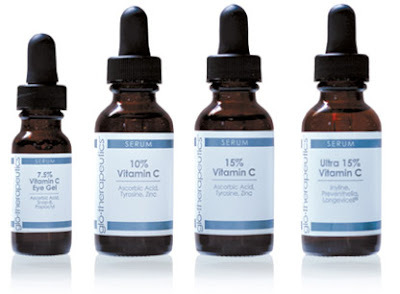 glotherapeutics launches vitamin c serums collection to revitalize and protect skin: coming fall 2010! glōtherapeutics, the skincare collection known for breakthrough-ingredients, high performance formulations, and a signature systematic approach to skincare, introduces an all new line of scientifically-proven Vitamin C serums to revitalize damaged skin and visibly reduce the appearance of wrinkles. This revolutionary new collection offers the most effective form of Vitamin C available, L-Ascorbic Acid, with breakthrough peptides to repair, strengthen, and protect skin cells resulting in a healthy, youthful-looking complexion. Stay tuned to our beauty blog for additional in-depth information on these cutting-edge ingredients.